The Mississippian Culture constructed hundreds of temple, effigy, fortress, and observatory mounds from the flood loam of the Mississippi River and her tributaries. The earthen hills contain burials, funerary objects and iconographic artifacts. Many descendants of the Mississippian culture view the mounds as sacred, and some tribes perform ceremonies at the ancient mounds to this day. The mounds were built of rich humus in agricultural lowlands, and starting in the 19th century they were destroyed by farm fields, canals, roads, and pot-hunters. Today, looting, mechanized agriculture, erosion, urban sprawl, tourism, off-road vehicles, and highway construction continue to diminish the mounds for future generations. The five most important mound complexes in North America—the Great Circle Earthworks, Octagon Earthworks, Great Serpent Mound, Alligator Mound and Cahokia Mounds—had to weather centuries of abuse to have the modicum of protection and respect they receive today. The Great Circle Earthworks and the Octagon Earthworks are intricate mazes of mounds, octagons, squares and circles covering 4 square miles near Newark, in central Ohio. Constructed around the year 250 by the ancestors of the Mississippian people called the Hopewell, the Great Circle and Octagon Earthworks most likely served as elaborate ceremonial structures where people gathered for large, seasonal rituals and ancestral rites. In the 1890s, the Great Circle was saved from tilling when it became the nexus of a fairground. In 1910, the Octagon Earthworks served as a campground for the Ohio Militia, which used the earthen circles for war games. Then the Moundbuilders Country Club turned the Octagon Earthworks into a golf course, incorporating one of the mounds into the sixth hole. Commenting on this juxtaposition, archaeologist Brian Fagen asks: “Would you tolerate a course for affluent golfers twisting and turning through Arlington National Cemetery?” Traces of a 60-mile “spirit road” connecting the Great Circle Earthwork to another major mound complex, exists in only four faint segments today. There are currently no plans to protect this ancient Native American religious thoroughfare. Great Serpent Mound, located in south-central Ohio, and Alligator Mound, southeast of Newark, are two of the most spectacular effigy mounds in the world. In the cosmologies of many Eastern Woodlands tribes, the two primary underworld spiritual entities are the Serpent and the Underwater Panther. Recent research by Ohio Historical Society archaeologist Brad Lepper suggests that Serpent Mound and Alligator Mound were built as shrines to these underworld spiritual beings. 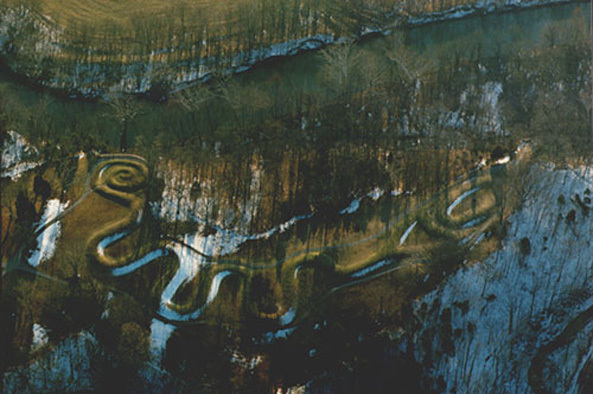 Though the Serpent Mound (pictured at top) remains an important religious symbol for Native Americans of the eastern woodlands, its religious integrity has been consistently threatened by urban sprawl and New Age spiritualists. In 1993, plans were drawn to develop the wooded areas immediately surrounding the Serpent Mound into housing tracts and a resort. The Army Corps of Engineers denied the developers a permit to dam nearby Brush Creek and build the proposed resort community based on the Clean Water Act. This action will allow Brush Creek and the environment surrounding Serpent Mound to remain pristine. On June 26, 2002, Crandell had gone to the Octagon Earthworks to pray at the observatory mound, which was built around the year 250 by the Hopewell culture. The Ohio Historical Society, which owns the site, has leased it to the Moundbuilders Country Club through 2078. The club operates an 18-hole golf course on the site and it is the only local golf course that is private. According to agreements between The Ohio Historical Society and the country club, members of the public are not allowed to walk on the site when golfers are playing. On Oct. 19, 2002, one of only four golf-free days during which the Moundbuilders Country Club allows unlimited public access to the Octagon Earthworks, 100 people gathered at the site to pray and express support for Crandell. Of almost 1,100 known mounds or archaeological sites in Arkansas, only two remain relatively untouched. The mound temples and historic villages of the Muscogee people who descended from the Mississippian culture, in the Ocmulgee Old Fields of Georgia have recently been subjected to intense development intrusions, including a proposed highway interchange, and in May 2003, the National Trust for Historic Preservation named Ocmulgee one of the 11 Most Endangered Historic Places in America. In Rockford, Illinois, Winnebago County is using a “Quick Take” provision under Illinois law to secure 9.4 acres of land along Kent Creek for a road extension that will destroy a number of effigy mounds and pristine wetlands. In Tennessee, three mounds are imperiled: The Tennessee Department of Transportation (TDOT) threatens the Hamilton Era Burial Mound near Knoxville. The ongoing development of Highway 56 in the Upper Cumberland Development Route in Jackson County threatens many mounds and Native American burials. Shallow Bluff Island in Rockwood, a Native American village and burial site, is experiencing significant erosion as a result of the unpermitted activities of a private landowner. Bobby C. Billie, a Seminole spiritual leader, declared that “these crimes against the indigenous peoples’ resting grounds must stop. I am sure that our ancestors are with us today asking you to do the right thing.” These mounds must be protected for the religious and educational opportunities they provide before further loss of cultural heritage occurs. Federal legislation like the Lower Mississippi Delta Initiatives Act calls for the study and preservation of the region’s cultural legacy. Petitioning U.S. and state representatives to pass legislation that protects the mounds will offer some defense against development, and yet, as reported above, Cahokia Mounds, like these other precious places of Native American heritage, is threatened by individuals who respect neither the law nor indigenous cultures. The Ohio Historical Society is in the process of developing a Cultural Resources Management Plan for the Newark Earthworks. The society is seeking feedback from the public, so please be sure to tell them your opinion. Click here to make your comment. If you plan to visit a sacred place like Cahokia or Serpent Mound, please consider eight principles for visiting a sacred site. Mounds entombing burials and grave goods should be given full protection under the Archaeological Resources Protection Act of 1979 (ARPA) and the Native American Graves Protection and Repatriation Act (NAGPRA). But state highways, private landowners, and all-terrain vehicles have ignored and violated these laws since they were enacted. Vigilant citizens can ensure that cultural resource management laws are closely followed by government agencies and federally funded developments, and that the laws are strictly enforced. To get involved or receive more information, please see Indian Burial and Sacred Grounds Watch. Lepper, Bradley T. “People of The Mounds: Ohio’s Hopewell Culture.” Ohio Historical Society, Eastern International, revised and reprinted 1999. ISBN 1-888213-48-5. Lepper, Bradley T. “Great Serpent.” Timeline, a publication of the Ohio Historical Society, September-October 1998, Volume 15/Number 5. Lepper, Bradley T. “Ancient Astronomers of the Ohio Valley.” Timeline, a publication of the Ohio Historical Society, January-February1998, Volume 15/Number 1. Searching for the Great Hopewell Road: A Landmark Journey into the Mysteries of the Ancient Hopewell People. 1998, Pangea Productions Ltd. VHS available from the Ohio Historical Society, tel: (614) 297-2357.